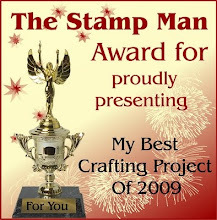 The Stamp Man: Stampendous Railway Clear Stamp Set - a few more cards! Stampendous Railway Clear Stamp Set - a few more cards! Here are a few more cards made with the Stampendous Railway clear Stamp Set SSC1139 that I featured here on Sunday with some other ideas/layouts. 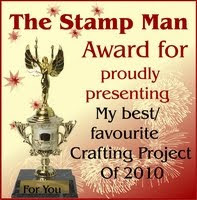 I have used the Stampendous CRN247 Locomotive cling stamp for the main panel. Again I used a coffee background and a Quickie Glue Pen to edge the mount for the main panel along with Stampendous Aged Gold Embossing Enamel. I coloured the main panel with chalks. The railway map makes a great border. I have trimmed off the border lines and torn one of the edges on the card below. Finally, a smaller version of the steam train card. I added some gold halo glitter into the mix to give it a bit more sparkle. I really think this is a great set for mens cards, especially those that are older who perhaps don't appreciate the usual sports or drink themed cards. Using them for scrapbooking would be good too! 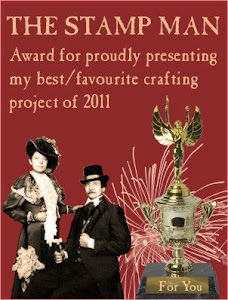 I'll be taking my cards to the Ross Papercraft show, Rainton Meadows, Houghton-le-Spring, near Sunderland on Sunday if you'd like to see the cards I made for the show and I'll be demonstrating the encrusted jewel technique there. A superb collection Jill, the encrusted jewel technique works fabulously with your style. Love them. Super vintage look you have achieved Jill !